My in-laws are moving out of their awesome house into an assisted living community, so I had to drive a 14' U Haul truck from the 'Burbs to a paper-shredding facility through Houston traffic™. It SUCKED. It only had 93,000 miles on the odometer, but apparently these were all very hard miles. The steering was loose, and the brakes were no better. I was getting the finger from multiple drivers as I cruised down IH-10 due to the fact that the damned thing would drift very closely to other lanes before my lightning-quick reflexes brought it back in line. Being a mathematical finance guy, I started doing the calculations in my head on how many consecutive days it would take me to actually cause a decent wreck. Five days, plus or minus two. I also thought about these odds as I was filling out the paperwork to rent it, which is why I opted for the all-inclusive insurance package they offered me. Yes, I bought it. No, I'm not a sucker; I'm a realist. I made it back to the rental place with no new scratches or dents. Sixty-nine miles of pure terror. My truck felt like a 458 Italia when I drove it back home to shower up and run back to work to return some calls and answer emails (one of those emails informed me that I landed a surgical center's 401k plan). 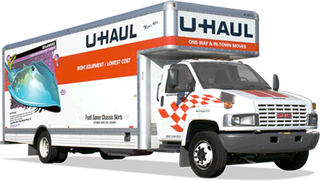 My end analysis is this: I will pay whatever it costs for movers in the future to never EVER drive one of those damned things again.